Why are we here? How did we get here? In particular, how did our galaxy, and the many others like it in the Universe, form? The consensus picture is that inflation stretched quantum mechanical fluctuations in the incredibly early Universe onto large scales, and that at the end of inflation these perturbations in the density of matter seeded subsequent structure formation. Regions more dense than the average exerted more gravity on material around them, accreting that material and eventually growing into the galaxies we see today. How did this growth process happen? Well, as we’ve said, gravity is important. Pressure is also, in some cases, important: the pressure of the material falling inward onto overdense regions can in principle stop it from being accreted. It turns out that this is only the case on smaller scales than those we focus on today, so put it out of mind for now. Finally, there’s the expansion of the Universe. General relativity relates the total energy density of the Universe to its expansion rate through the Friedmann equation, and basically says the more energy density you have, the faster your Universe expands. Now, to grow a density perturbation, you must compress more and more matter into a given region: this increases the density there. If the Universe is trying to stretch as you do this, that makes it harder to squeeze more material into the region. This point is the key idea of the classic paper we discuss today, written by Peter Meszaros in 1974. This paper describes the growth of perturbations in an expanding background, and is the origin of the Meszaros effect, usually a subsection in every cosmology textbook’s chapter on structure formation. Meszaros derived a single equation governing the growth of perturbations in an expanding background. It has 3 terms: the first is an acceleration, describing the rate of change of the growth of the perturbation. The second is a forcing term, just like in the standard harmonic oscillator problem: it is proportional to the size of the perturbation. physically, this means a bigger perturbation grows faster—not surprising, as such a perturbation exerts stronger gravity on the particles around it. What is important about this second term is that it is only proportional to the density in the perturbed component. In other words, if you have a region with only extra matter, the forcing only cares about that extra matter, not whatever else might be in that region (as long as whatever else is in the region has density at its average for the Universe). In particular, you can throw in as many photons or neutrinos or gravitational waves as you like in the Universe, but they will not help a perturbation to the matter grow any faster as long as they are at their Universe-averaged values. Now we come to the third term in the Meszaros equation. This describes how the expansion of the Universe slows the growth of perturbations; it is usually called the “Hubble friction” or “Hubble drag,” because the Hubble parameter enters into it. What is vital here is that all of the stuff in the Universe contributes to the Hubble drag—so the more total energy density in the Universe, the more pronounced the damping effect on perturbations’ growth. In particular, you can add as many photons or neutrinos or gravitational waves as you like to the energy density, and while they won’t help the perturbation grow, they will help the Universe expand—and so actually slow the perturbation’s growth down. 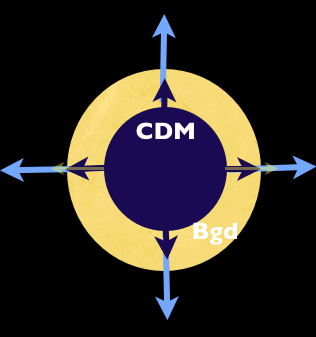 The CDM, (cold dark matter, dark blue) is over dense, and therefore expands more slowly than the background universe in light yellow (with light blue arrows). Thus from the perspective of an observer comoving with the background Universe’s expansion, the CDM appears to contract. But it is harder for the CDM to accrete matter because the background’s expansion is pulling matter in the opposite direction. This was Meszaros’ key insight. Indeed, he was a bit more specific: he pointed out that if galaxies in a cluster are to be gravitationally bound to each other, there cannot be much mass in the Universe hidden in photons, gravitational waves, or neutrinos. If the density of these exceeded that of the matter, then the clusters would continue to expand with the background Universe. Today, Meszaros’ paper is important not primarily because of this specific point, but rather because it turns out to describe well the growth of perturbations in the first 200,000 or so years of the Universe, when radiation dominated the energy density but matter perturbations were trying to grow. The Meszaros effect is the fact that the radiation’s dominance over the matter slowed the growth of structure over what it would have been had the Universe been matter-dominated. I'm a 2nd year grad student in Astronomy at Harvard, working with Daniel Eisenstein on the effect of relative velocities between regular and dark matter on the baryon acoustic oscillations. I did my undergrad at Princeton, where I worked with Rich Gott on dark energy, Jeremy Goodman on dark matter, and Roman Rafikov on planetesimals. I also spent a year at Oxford getting a master's in philosophy of physics, which remains an interest. Hi Zachary! This write up is really interesting, but one part in particular was very counter-intuitive to me. You wrote that “you can throw in as many photons or neutrinos or gravitational waves as you like in the Universe, but they will not help a perturbation to the matter grow any faster as long as they are at their Universe-averaged values”. This makes sense for photons and neutrinos, but I would have thought that gravitational waves by their very nature would create additional perturbations to the matter…? Thanks!